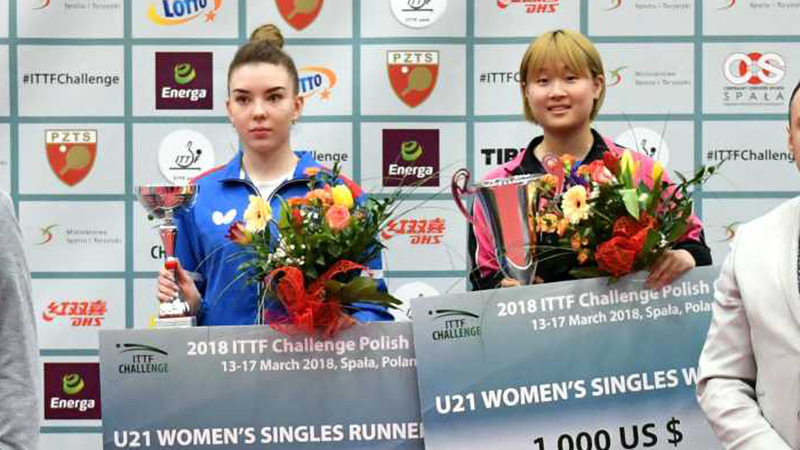 Friday 16th March played host to the penultimate day of the 2018 ITTF Challenge Polish Open; the day very much belonged to Korean competitors with great success across both singles events while there was also the small matter of the two Under 21 finals. Here’s how day two unfolded in Spala. The Women’s Singles competition resumed with Round of 16 action in the morning session of day two with a couple of big upsets occurring in the lower half of the draw. Manika Batra got the ball rolling with a stunning display leading the Indian to a six games triumph over last year’s runner up Saki Shibata (11-8, 11-9, 11-5, 8-11, 6-11, 11-9) while Pauline Chasselin also upset Japanese opposition as second seed Hitomi Sato fell to the French player in dramatic fashion (11-9, 12-10, 6-11, 11-9, 3-11, 10-12, 11-7). Seeded 14th, Manika Batra had performed exceptionally well to reach the quarter-finals stage in Spala but that was as far as her heroic journey would take her; in the last eight Batra lost out to third seed Yang Haeun (11-4, 11-8, 11-6, 11-8), who meets Ukraine’s Margaryta Pesotska for a place in the final. Displaying excellence throughout the day Honoka Hashimoto, seeded fourth, registered back-to-back victories without dropping a game with Choi Hyojoo (11-7, 12-10, 13-11, 11-7) and Tsui Pao-Wen (11-8, 11-3, 11-8, 12-10) both falling to the Japanese star. However, it was Jeon Jihee who stole the show following her powerful outing against top seed Suh Hyowon (11-8, 5-11, 11-2, 19-17, 11-6). The Men’s Singles title will be presented to Korea Republic after four of the country’s competitors locked out all of the semi-finals positions on day two. Qualifier Cho Daeseong enjoyed a terrific day in Spala, defeating 23rd seed Grigory Vlasov (11-9, 11-7, 11-2, 5-11, 11-5) before achieving a thrilling seven games victory over second seed Kou Lei (10-12, 13-11, 11-8, 7-11, 11-9, 9-11, 11-8) to seal a penultimate round tie with No.8 seed Lim Jonghoon. Jeoung Youngsik survived a major scare in the last 16 with Russia’s Kirill Skachkov pushing the 27th seed right down to a deciding game (11-9, 11-9, 11-3, 6-11, 5-11, 9-11, 11-8) but the Korean proved much more successful against Qiu Dang in the following round (11-6, 11-5, 12-10, 17-15). Fourth seed Jang Woojin beat Slovenia’s Darko Jorgic in straight games (11-7, 13-11, 11-8, 12-10) to claim the other semi-finals spot. Against expectations the host nation received a gold medal on the penultimate day of play in Spala as Marek Badowski upset the seeding list to lift the Under 21 Men’s Singles trophy. The No.6 seed recovered from a two games to one deficit in the final, prevailing over third seed Andreas Levenko across five games (11-5, 9-11, 8-11, 11-5, 11-5). Unseeded qualifier Kim Jiho emerged victorious in the Under 21 Women’s Singles competition following a magnificent display against Russian sixth seed Mariia Tailakova (11-4, 11-6, 11-4).